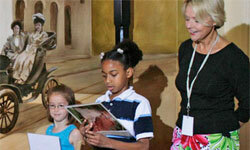 Immerse your elementary school students in history with a Field Trip. Bring your middle and high school students on a self-guided History Hunt. Challenge post-secondary students with an Artifact Contemplation activity. Engage your class in a whole new way at a Museum Program. Bring the museum to your classroom by reserving an Education Trunk.